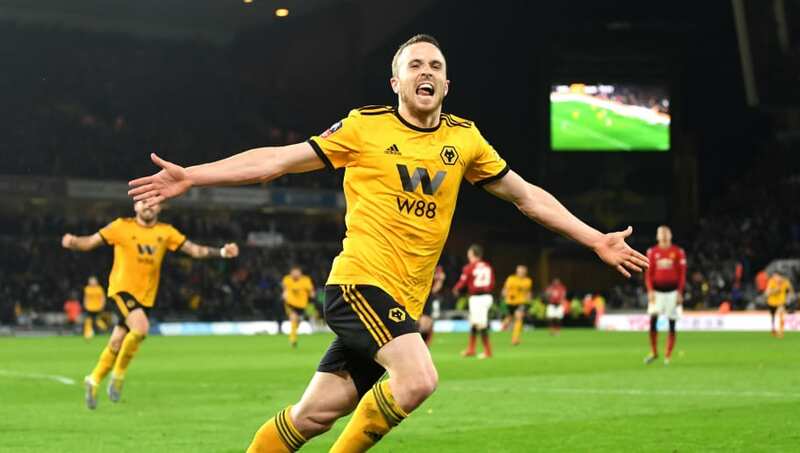 Well taken goals from Raul Jimenez and Diogo Jota were enough to knock Manchester United out of the FA Cup, as Wolves wrapped up a narrow 2-1 win. After an uninspiring first half from both teams, Wolves came out after the break and looked to continue their plan of catching United on the counter, with the plan working perfectly for Nuno Espirito Santo's men. First, Jimenez spun neatly in United's box to fire through a crowd of legs, before Jota steamed away from Luke Shaw on the counter before firing a low effort past Sergio Romero in United's goal. Ole Gunnar Solskjaer's side suffered a second defeat in a row against a determined Wanderers side and his team were clearly second best in a game they went into as slight favourites. Marcus Rashford pulled back a consolation goal in injury time but it was not enough to save the Red Devils. Wolves felt that they should have had a penalty in the first half when Chris Smalling appeared to wrestle Willy Boly to the floor following a Wolves corner. Referee Martin Atkinson waved away the penalty claims and the incident wasn't looked at by VAR [video assistant referee]. The replays showed that there was contact and that Smalling's arms were on the Wolves defender as he hit the turf, but it would have been a harsh decision. In the end, Wolves didn't need the penalty to win the game but questions will be asked as to why they were denied a spot-kick - with VAR very much back in the spotlight. Experienced Portugal midfielder Joao Moutinho pulled the strings in the middle of the park for Wolves and allowed the team to tick over, and, at times, overrun a sub-par Manchester United midfield. He also had a few chances to score and was denied by some fine goalkeeping from United keeper Sergio Romero. Wolves are a delight to watch. What an unbelievable job Nuno Espirito Santo is doing. João Moutinho yet again phenomenal, Diogo Jota too. And of course Raul Jimenez. Semi-final of the FA Cup, 7th in the league and beating the big boys for fun. Wolves are on their way to Wembley! His partnership with 22-year-old Ruben Neves has developed over the season and is a reason why Wolves are so hard to play against. His performance will have pleased manager Nuno Espirito Santo and the Portuguese must be one of the first names on the team sheet. Victor Lindelof was shown a straight red card by Martin Atkinson in the 81st minute for a challenge on Diogo Jota. In real time this seemed like a harsh decision, which was the opinion of the vast majority of Manchester United players. VAR reviewed the decision, and despite the tackle being reckless and the Swede's trailing leg clearing Jota out, the video referee decided that only a yellow card should be awarded. The decision didn't detract away from what was a subdued performance from United - with many of Solskjaer's players appearing jaded after their recent Champions League exploits. They offered little going forward, and without Romelu Lukaku, lacked a plan B to break down a dogged Wolves defence. Sergio Romero must be cursing his luck to be playing at Manchester United at the same time as the world-class David De Gea. Romero would be first choice at most top clubs, yet his appearances for United are reserved for the cup competitions and the odd league appearance. Yet, every time he plays, he looks fresh and alert, pulling off save after save. These performances would usually warrant a promotion to first choice keeper but unfortunately for the Argentine, De Gea is in his way. If it wasn't for some fantastic saves from Romero, Wolves could have scored three or four instead of two and were denied by the superb 32-year-old on a number of occasions. ​Wolves travel to Burnley in their next game in the Premier League. A win will strengthen their claim for seventh spot, whilst Burnley will be looking to move away from the relegation zone with three points. ​Manchester United host eighth placed Watford in the next round of Premier League games. A United win, and other results going their way, could see the Red Devils move up into the last Champions League qualifying place.